Fennelly's Custom Sheet Metal Ltd. The pinnacle of Carrier® engineering, our Infinity series heat pump with Greenspeed® intelligence offers precise heating and cooling, unwavering comfort, uncompromising energy efficiency and ultra-quiet cooling performance. If you're searching for the most economical way to get into a more efficient heat pump, look no further than our versatile Comfort series. 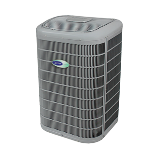 These models offer summer dehumidification and air conditioning as well as cold-weather heating performance. We provide Sheet Metal Work, Design and Fabrication, Air Conditioning, Heating, Ventilation, Installation and Service in Newfoundland & Labrador. Copyright © 2017 Fennelly's Custom Sheet Metal Ltd.